The kickstarter for the CollectorVision Phoenix is now live. This is a 3d printed prototype. Kickstarter versions would be injection molded. This is an open source system so other cores will be possible in the future. Edited by Bmack36, Wed Oct 10, 2018 7:22 PM. 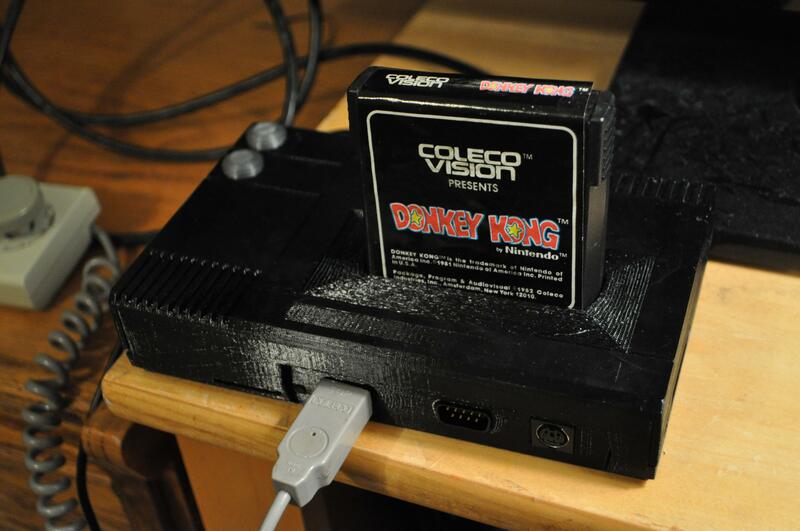 If it is open source they are probably using the Colecovision core of the MiST or similar. That's perfectly acceptable, as long as they keep the code open and share their modifications. Bonus points if they actually contribute to the core projects. Okay, I'm now officially in. Come on, $230k. Big money, no whammies. It'd be a solidly doable goal if only the Phoenix were to receive even half the media attention of a certain other coleco-themed project from the recent past. Edited by Reaperman, Thu Oct 11, 2018 8:43 PM. Hey there, are you still working on getting some direct footage available? Its hard to get an idea of video and audio quality via off screen captures. Thanks. So many of the cheapo, cashgrab kickstarter consoles instantly exceed all of their crowdfunding goals. It's a shame that when something that's so much more interesting comes along, instead of it becoming a viral success, I hear crickets from the normies/press. Edited by Reaperman, Fri Oct 12, 2018 9:12 PM. Well, their past kickstarters had some hiccups. That might contribute to people not contributing. What other kickstarters has Collectorvision done? Yeah, I'm also curious since this Phoenix kickstarter looks like it was set up to look like their first one. Was it this kickstarter? Its listed under one of the 'collaborators' accounts, and seems to currently have some hiccups. Damn, people had to wait three years to get the game? It looks more like it's still a currently waiting thing. Some (most?) of the snes ones got out the door, but the nes backers are still waiting for the game to be finished, with the latest update in april--at least that's how I read it. 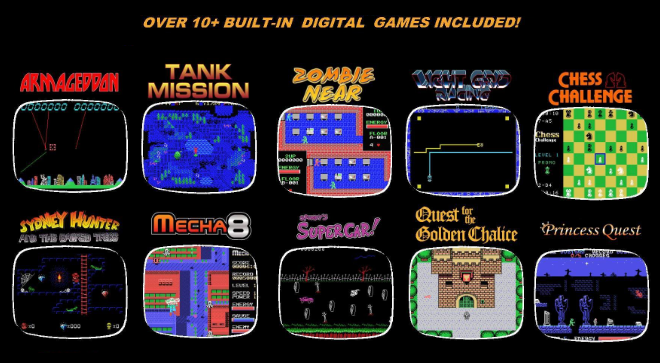 I get the feeling there's at least one 'sydney hunter & the caverns of death' port in line before the colecovision one. Very much hopeful this will succeed, but there are a few more moving parts that all have to line up, which I hadn't previously considered when I entered 'just take my money' mode. I wonder how they'd handle the pack-in completing at a different time than the console. The previously released sydney hunter game is also built into the firmware--at least as I read it. I can't tell for sure what the text is below the 'sydney hunter' part on the pic, and there are a couple other games on there that I can't make out. I also don't exactly know what "over 10+" means in this context--am I having trouble 'reading between the lines' or something? Edited by Reaperman, Sat Oct 13, 2018 4:52 PM. So the initial rush of backing is over, and kicktraq is projecting 79% funding currently. Swlovinist just popped his video out, and he's got a nice reach. 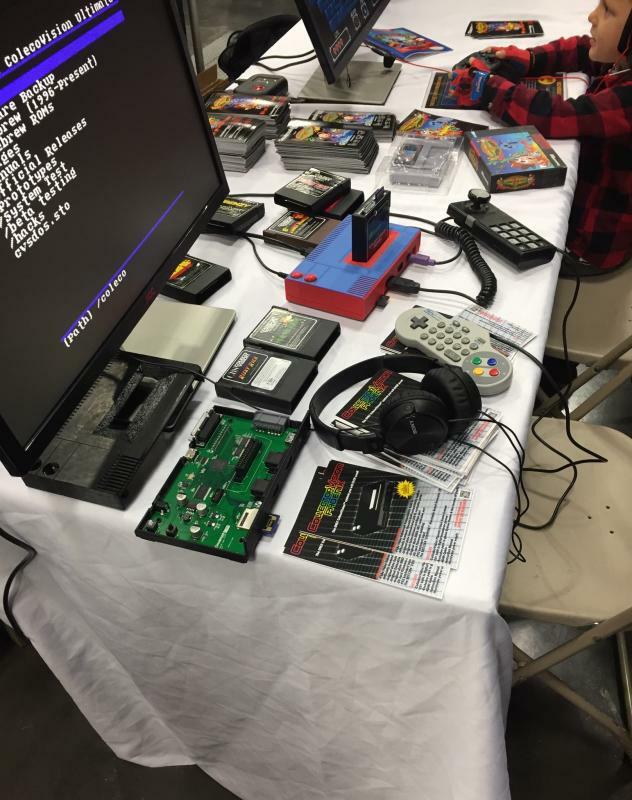 Additionally, the PRGE demo is probably what makes or breaks this thing. I don't think there's been any mainstream press coverage yet. Edited by Reaperman, Sun Oct 14, 2018 1:16 PM. True, I forgot about the PRGE. What a fantastic way for people to see this thing working live. I'd bet many would support it right then and there after seeing it demoed. The price seems high, but I think this is a good idea because of how failure prone the original hardware is. FPGA is like the next best thing to original hardware. 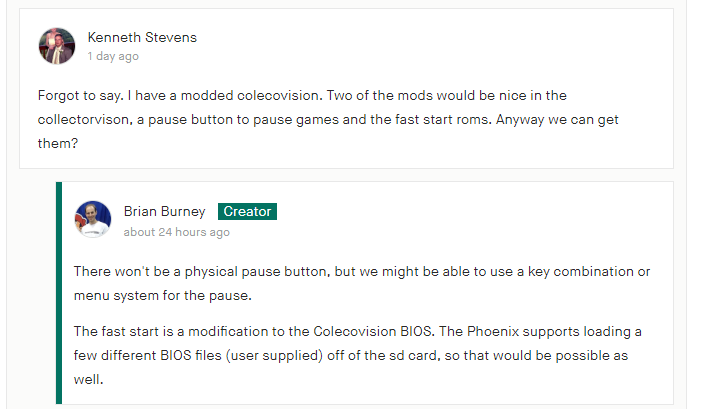 One should also remember that the Phoenix is open source, there are plans to add other game system and computer cores in place such as the 2600 and MSX and the expansion port should prove interesting. Indeed, that's the long and the short of it. I feel like it was too little, too late, on a project that was pitched as being far more complete at the time of funding than it apparently actually was. Fun game, though. But hey, at least I didn't get a DVR card in a jag shell. Does it come with an onboard BIOS or is the SD card the way to have any BIOS at all? It was said it will have a BIOS that replaces the splash screen with the CollectorVision one, so I take that would be onboard. Yes there is an onboard BIOS. You can optionally add BIOS files to the sd card to load them instead of the onboard one. Dont have much to add other than a picture. I didnt stick around to play it or talk to John about it. Edited by Eltigro, Sat Oct 20, 2018 11:51 PM. It looks pretty legit, they say they are are planning to support 240p via add-on later. Thanks for another pic of the red one. I really like that color scheme, it reminds me a little of that old nintendo soft-side carry case. That's the best quality picture I've seen of it yet. What's that device behind the second monitor? Some kind of homebrew trackball? Yesterday was their 3rd best sales day, thanks largely to this booth, I'd wager. Edited by Reaperman, Sun Oct 21, 2018 4:57 PM. They have added a 2600 core which in and on itself seems a great idea, it kind of points to that CV alone may not be enough of a seller imho and probably the reason why kevtris bundled many 8bits cores into his NtMini (unofficially but). The combo now looks a nice thing given it's all SD-loadable (no jb) ... time will tell. I think they should add MSX and SG1000/SC3000 just as well because of CV similarity, the effort should be contained enough to not add too much to the dev time (I kind of remember that 8K/16K is really all that is needed for MSX games to run, on 8K many have been ported to SMS and on the 32K of the CV-SGM). I reckon the more cores they add the less of a CV but in the end it's an FPGA based system, the more cores the merrier (assuming a quality job of course which seems the case), being reconfigurable is what distinguishes an FPGA system anyhow so may as well take advantage of it.